Are you tired of the continual presence of God in your life? Does the divine intervention of a loving, all-knowing Creator just get under your skin? Would your daily routine be easier without the constant meddling of a God who has your best interests at heart? If you answered yes to any of those questions, this is the blog post for you. It might seem strange to suggest we can somehow limit the Creator of the universe, but we need look no further than the Bible’s account of the Israelites for proof that it can be done. It was King David himself who wrote, “Yes, again and again they tempted God, and limited the Holy One of Israel” (Psalm 78:41). So what’s the secret? It’s simple, really. There is no limit to what God can do, but there is a very real limit to what He will do. Certain actions on our end will make it harder and harder for Him to be intimately involved in our lives—so if you’d like to keep your interaction with God at the absolute bare minimum, these three tried-and-true steps are guaranteed to keep Him at arm’s length. They worked for many people throughout history, and there’s no reason they can’t work for you too! When it comes to thoughts and actions, God operates on a completely different plane than human beings (Isaiah 55:9). Because of His unbiased perspective and perfect understanding, He often makes decisions that—from our inadequate vantage points—make absolutely no sense. You might think this should make it easier to trust God, but human nature enables us to set our own expectations as our standard. When God inevitably fails to rise (or rather, stoop) to those flawed expectations, you’ll be amazed at how easy it is to transform that disappointment into skepticism and doubt. Remember that when Jesus came to visit his hometown of Nazareth, “He did not do many mighty works there because of their unbelief” (Matthew 13:58). The key to this step is simply latching on to any fragment of doubt you can muster. Once you get that far, you’ll discover how easy it is to nurture that doubt and let it grow into something massive. And don’t worry! Doubt is a hardy, extremely resilient weed, so you would need to make a very concentrated effort to do any serious damage to it. The Israelites watched God send down bread from heaven and call forth water out of a rock, but if they woke up in the mornings with so much as a crick in their neck, they were still able to immediately accuse God of irrationally plotting their total annihilation. It won’t happen overnight, but with enough practice, you too can have this level of doubt toward God! Once your doubt is strong enough, you’ll begin to notice God seeming a little more absent from your life. If you’d like, feel free to view this as His fault and use it to further bolster your skepticism as you proceed to the next step. A word of caution: As powerful as doubt can be, it’s necessary to remember that even a little perspective can undo all your hard work. The author of Hebrews notes that “he who comes to God must believe that He is, and that He is a rewarder of those who diligently seek Him” (Hebrews 11:6), and the apostle James adds that Christians are to come before God “in faith, with no doubting, for he who doubts is like a wave of the sea driven and tossed by the wind” (James 1:6). Take this to heart! Making allowances for the fact that God might know and understand more than you is like taking an axe to the roots of your doubt—so be sure to avoid this under any circumstances! Through the Bible, God provides us with a great deal of instruction about getting the absolute most out of life. However, many of these instructions can appear counterintuitive on the surface. Give up a tenth of our hard-earned money? Sacrifice one day out of seven to worship God? Lose our lives in order to find them? If you’ve really dedicated yourself to the previous step, then by now you ought to have a litany of questions about these instructions. Doesn’t God know I need that money to pay bills? Doesn’t God know I need that day to take care of all my responsibilities? If God really loves me, why does He want me to shift my focus from the things I love? Excellent. At this point your doubt is strong enough to prompt some action on your part. You should be seriously concerned that God might not really know what’s best for you—which leaves you with only one choice, really. You’re going to have to start ignoring the instructions that are just asking too much of you. Not all at once, of course. There’s no need to jump in blindly, here—just dip your toes in for now. After all, what you really need is just a little breathing room. Maybe you don’t need to set aside a full ten percent of your income—after all, five or six is more than enough, isn’t it? Maybe you don’t need to spend a full day observing the Sabbath—after all, you made it to services this week, didn’t you? And maybe it’s okay to put a couple things ahead of God—after all, this mortgage isn’t going to pay itself, you know? It might take a while to get comfortable with this new approach, so don’t feel the need to rush. You’re probably going to feel some guilt for a while, but that’s okay—just stick with the gradual approach and eventually it will pass. There won’t be any bolts of lightning or pillars of fire. You’re just doing what you need to do—and once you’ve come to accept that, it’s time to move on to the final step. A word of caution: Ignorance is vital here. The apostle Paul encourages Christians to “Test all things; hold fast what is good” (1 Thessalonians 5:21). It is essential that you do not do this. If you faithfully tithe even when it seems to promise financial ruin, you might start to see God “open for you the windows of heaven and pour out for you such blessing that there will not be room enough to receive it” (Malachi 3:10). If you start to faithfully observe the Sabbath even though you’re not sure how you’ll manage without those extra 24 hours for getting things done, you might start to find that you “delight yourself in the Lord” who will “cause you to ride on the high hills of the earth and feed you with the heritage of Jacob your father” (Isaiah 58:14). And if you discover that seeking your own interests only leads to an empty vacuum of an existence, you might start to find the truth in Christ’s statement that “My yoke is easy and My burden is light” (Matthew 11:30). In other words, following God’s instructions will only bring you closer to Him, which is certainly not what you want. If God doesn’t know what’s best for you, then you’re going to have to replace Him—and who better to lead you than…you? After all, you know what you want. You know what you need. Up until now it’s been a matter of gradually letting things fall away, but now it’s time to drop the façade. You don’t care what God thinks or what He wants you to do—you only know that it’s been a long time since you ever felt close to Him and that it’s high time to take matters into your own hands. No, it certainly didn’t end (and will not end) well for Satan. But that’s not what you wanted, was it? A good ending? No, as I recall, you wanted to keep God as far from you as possible. Well, Christ told the disciples that He “saw Satan fall like lightning from heaven” (Luke 10:18). I don’t know how much farther you can get from God than being hurled by Him through the cosmos, and since these three steps have you following a path strikingly similar to the one Satan took, it’s safe to assume that you’ll find a similar void between yourself and your Creator. God will not dwell with sin (Psalm 5:4), to the point where He couldn’t even be close to His own Son when Christ became the sacrifice for our sins (Mark 15:34). And at this stage, you’re well on your way to willingly making sin your lifestyle. Do you think God will want to be anywhere near that? A word of caution: This might seem like the absolute end of the line—but believe it or not, it’s still possible to undo everything you’ve worked so hard to accomplish. Because God is “longsuffering toward us, not willing that any should perish but that all should come to repentance” (2 Peter 3:9), your genuine repentance can still throw a giant monkey wrench into the gears of this whole process. God is more patient with us than we could possibly deserve, and ultimately desires every human being to join His perfect spiritual family—and while He hates sin in all its forms, He is eager to work with all those who are seeking both His forgiveness and a way to leave those sins behind forever. Such a mindset would be absolutely detrimental to your plans of distancing yourself from God and must be avoided at all costs. So long as you cling to the prescribed attitude of willful and belligerent sin, you will be successful in completely severing any relationship between yourself and God—primarily because this is the path that will one day lead you to complete and final destruction in the lake of fire. God is longsuffering, but He is also merciful—if you are determined to live a life that brings pain to yourself and to those around you, the most merciful thing God can do for you is to end your existence. He wants you in His family, but He will not force you to be in it. Of course, if you’re having second thoughts about whether or not this is the path for you, now would be the perfect time to reevaluate where this is all heading. It takes a very special kind of person to see this plan through to fruition, and if you decide an alternate destination sounds a little more appealing than total obliteration, it’s never too late to reconsider a relationship with God. 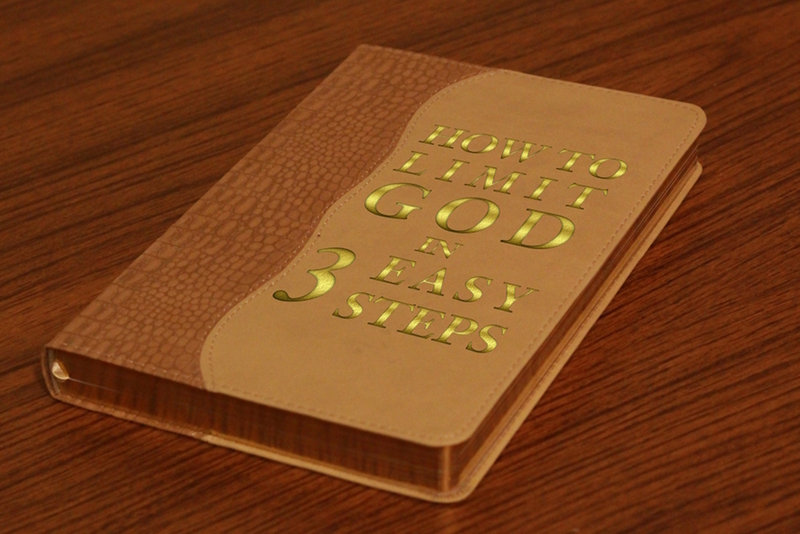 6 Responses to "How to Limit God in 3 Easy Steps"
This reminds me of the book “The Screwtape Letters.” Good food for thought. Masterful writing, Jeremy. A fantastic article! NO!! I welcome him, and it isn’t my place to limit him in my life. An article that shows – “This is the Way, walk in it. Thank you for expanding the words “Limiting the Holy One”. Beautiful post. Thank you Jeremy! !